Rose Red -- There are 8 cows and 8 bulls who are located from one to 80 times in all the high dollar modern Texas Longhorn cattle pedigrees. There are a few cattle who do not trace to any of these great foundation cattle, but without fail, the best stock trace multiple times to these 16 foundations. Some cattle had the DNA strength to produce superior to themselves, and others never produced as good as themselves. These 16 bred over their own heads and have continued for many generations to add value. This group, represents the families of Phillips, WR, Wright and Butler. Rose Red was one of the 8 major contributing cows. Milby Butler operated out of League City, Texas. Over the years he dealt with a lot of people in the area and just a few became Texas Longhorn fans. Some of his close friends he allowed to own his better stock and others just got the culls. In the area of Dayton, Liberty, Dickinson, and Trinity were "nests" of Butler cattle. I drove these roads hunting big horned cattle back and forth. Blacky Graves knew all the people but never offered to help me make contact with these fellow producers, even though I often asked him. Uncle Doad Partlow, Sheriff Buck Echols, Jerry Partlow, Pauline Russell and Sam Partlow were owners of early registered cattle. I had written them for information on buying some of their cattle. Once Sam replied "I don't have any Texas Longhorn cattle and none are for sale." In time I knocked on the door of Sam Partlow's big southern home and he opened the door. With some tender encouragement the following day we were looking at his Butler blood cow herd. They had the most horn of any of the Butler herds. They were dominant red or seal brown with very little white color. He "without shame" bred them to his flop-eared Red Brahman bull and said the cross bred calves sold well at the Raywood Auction. 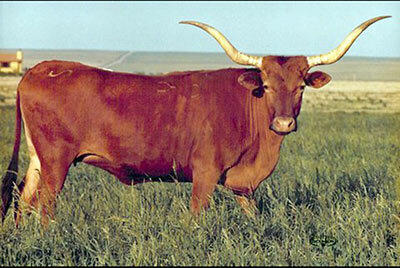 Sam had donated one of his cows to the Texas A & I Longhorn research project near Kingsville in the early seventies. His cow Rose Red was sent to A & I and rejected because she was not "beefy" enough for the program. She was dark red, excellent horn for that time and bred to a Red Brahman. Over a period of 4 days I was able to buy all the best cows from Sam's herd. That was March 1, 1979. All of that negotiation was documented in the eBook FILLET OF HORN II which can be bought from Amazon. Once the Red Brahman calf was born she was placed in the DCCI embryo program. Classic was the most popular bull of the day so she was flushed several times with him. The first embryo calf was Sweet'N Low who was also the first cow in the breed to measure 48" T2T at 24 months. She was purchased by Betty Lamb for $114,000. That history is also in the Fillet of Horn II book. Rose Red produced 28 well known embryo calves. I sold one of the first recips with a Rose Red embryo for $4500 to Johnny Hoffman. I delivered the recip to Johnny at the Forth Worth Stock Show Longhorn sale. I also consigned the first pregnant recip to sell at Fort Worth -- it was a time the buyers feared they would get a cross bred calf. They only bid $1300, so I protected the recip and bought her back. After the sale Johnny also bought that pregnancy for $4500. When they calved the first one was Dixie Rebel. The one I protected for $1300 was Dixie Hunter, the sire of Tabasco. Once the strength of the Classic X Rose Red matings were known, we were selling guaranteed pregnancies for $12,000 per recip. We took deposits and at one time over a dozen orders were presold. The Rose Red, Doherty 698 and Rangers Measles pregnancies were $12,000 presold orders. They were the most expensive of all. Rose Red may be found as a foundation producer in pedigrees of Trophy, Top Caliber, Rodeo Max, Eternal Diamond, Vanilla Milkshake, Respect Me, Big Wig, ZD Kelly, etc.